An app provides many benefits over a simple mobile website. First an app does not need a connection to the internet to run. It also provides a custom interface to better suit your needs and creates a l presence on your customer’s devices. If a website does not load within 5 seconds many customers will leave and never return, an app helps you keep these customers by providing a better experience. We write customized apps for businesses that allow your field based employees to get updates about job sites, place orders, look up customer info, and more all while having limited access to the internet. More and more businesses are realizing the benefits to be derived from having a mobile app for their business. Let us help you advance your business in this area. We are committed only to results and will ensure your business is equipped with an app that meets the needs of your employees and customers. •	Building brand loyalty amongst customers. •	Increases the customer’s ability to access your product or service. •	They gain easy access to your product or service. •	They are able to receive up to date notifications on special events, coupons and sales. •	Contacting your business is just a touch away. The team at CTSWeb is able to write custom apps with features unique to your business and your customers. We have been providing this high quality service for years and at a price that facilitates value for money. While there is much benefit to be derived from an app that enhances the customer experience, at CTS we also design and create apps that facilitate business operations. Our expert programmers are able to produce apps that will allow field-based employees to get updates about job sites, ability to place orders, look up customer information, and much more. There is no doubt that an efficient business operation spells well for business performance and customer satisfaction. At CTSWeb, we have the capacity to create apps that are compatible with Android, Apple iOS, Windows Mobile, and BlackBerry devices. 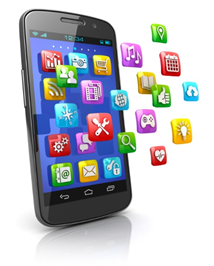 Consult with us today and see how we can take your business to the next level with a custom app.